Last chance to enter the 20k giveaway is today; winners will be announced tomorrow! My sweet friend Kelly (you might want to go give her a follow, she’s awesomely talented!) gave me these Parisian dies for my birthday after I got back from my European vacation…and though I’ve used them since then, I just haven’t had a chance to get any projects with them onto my blog til now! The second project is a decorative piece; though the popstand version can be used inside a card, I wanted something visibly reminding me of my amazing trip. It’s either a holiday decoration or a year-round one! Watch the video below to see both projects – or click HERE to see it in HD on YouTube! The glass glitter isn’t, in my opinion, glitter; it’s more like confetti, or flakes. It’s not nearly as messy as glitters – but oh the shine! And those inksheets are a lot of fun – I saw a demo at CHA and the white one? Seriously white and bright. If you haven’t tried it yet and want to, they do have a little kit – with the pad and a selection of colored sheets. My second project was way fast once I made the decision to go white! I played around with a couple different colors, and as I pictured the shelf I wanted to put this on, the other colors just wouldn’t show up. White seemed just perfect! For the topper, by the way, I put some of the Multi Matte Medium (the bottle with the brush this time) on the end of the tower, then dipped it into the glass glitter. I painted some of the same glue onto the base and added the glitter to it by shaking it on. Super easy! Both projects are beautiful!!!! Love them! Thanks for sharing! Fabulous! Love the Eiffel shaker idea! TFS Sandy love the colour combo for the card tower. The 3D looks awesome with addition of the texture paste. Oh Sandy, you are soooooo clever! Now I must have that die!! HAHA Thank you!! What stunning projects!! 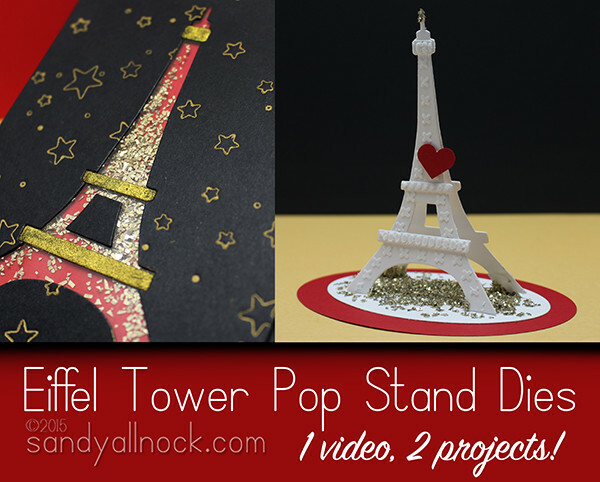 I LOVE that pop up Eiffel Tower die!! Such fun projects these are. I miss Paris too. I love both these projects. Cannot wait to try my transfer sheets with dies. And using a die as a stencil is a great idea. Another use for a product. Great ideas. Thanks for sharing. Such a lovely gift and wonderful way to remember your trip! Gorgeous projects! Sandy these projects are so creative! Thank you for showing off my die so spectacularly! Very pretty Sandy. 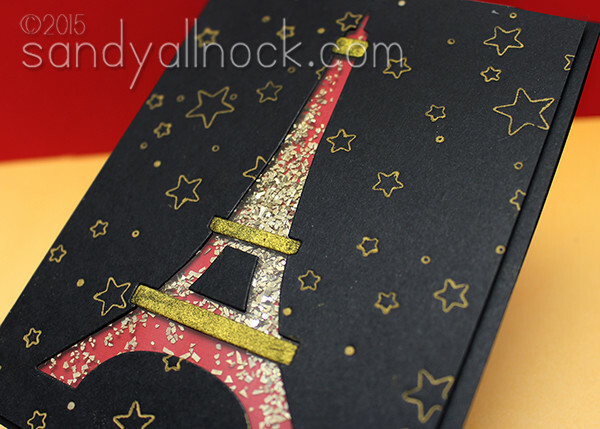 I love the black with the gold stars on the background of the card. Your 3D tower is so very nice with that glitter on top. Thanks for sharing. New products are bad for my credit card! 🙂 Thanks for showing this and keeping us updated about the latest and greatest crafting stuff. Looking forward to your Vlog tomorrow!